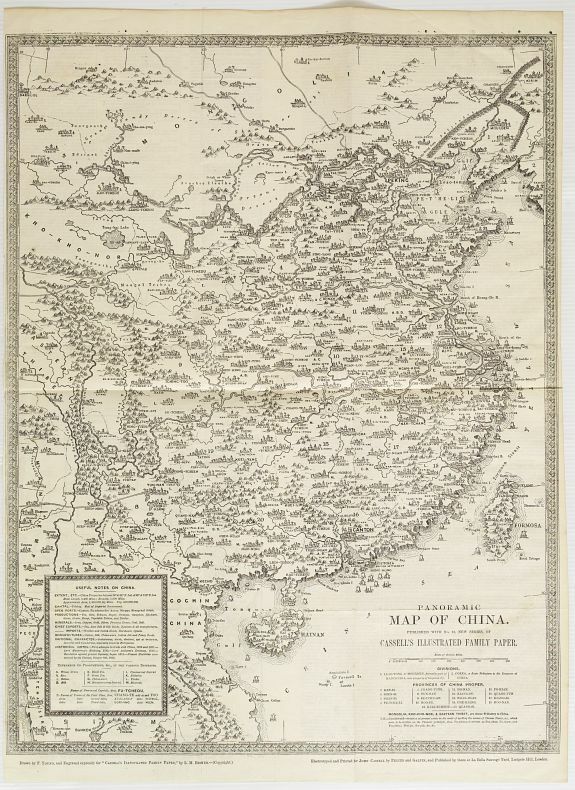 BECKER - Panoramic map of China. Published with No.16, new series of Cassell's illustrated family paper. BECKER, L.M. - Panoramic map of China. Published with No.16, new series of Cassell's illustrated family paper. Panoramic map of China. Published with No.16, new series of Cassell's illustrated family paper. - BECKER, L.M. Title : Panoramic map of China. Published with No.16, new series of Cassell's illustrated family paper..
Map maker : BECKER, L.M.. Date : London, John Cassel, March 20,1857. Size : 20.9 x 16.1 inches. / 53.0 x 40.8 cm. Description :Uncommon map of China and Taiwan with relief shown pictorially. Published with No. 16, new series, of Cassell's illustrated family paper. In an inset lower left "Useful notes on China". On verso: An account of China, historical, descriptive, statistical and social sketch of the Chinese nation, its rise, progress, and fortunes? With an inset of a chart (245x185mm.) showing Hong Kong, Lantao Islands, and the approaches to Canton with the four other ports open to English commerce. Prepared by Lewis M. Becker and John Cassell (1817-1865). Cassell's Illustrated Family Paper was published from 31 December 1853 to 9 March 1867. Condition : Left hand margin cut close to outer border.